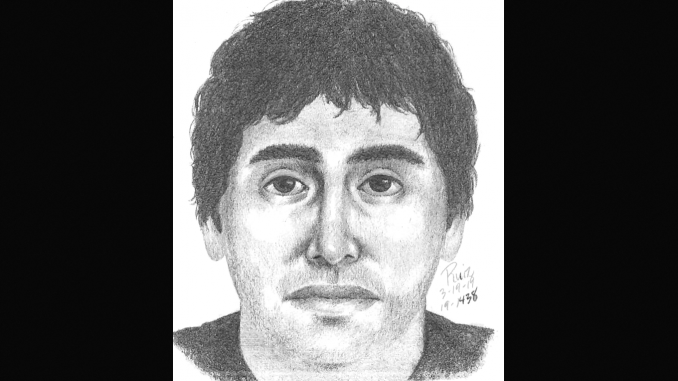 A sketch of the intruder on Ventura Avenue early Sunday morning. Palo Alto police are looking for a man who man who appeared in a woman’s Ventura Avenue apartment, sat down on the bed and began talking to her. He left moments later and hasn’t been arrested. It happened Sunday at about 3:15 a.m. in the Merrilee Terrace Apartments behind the Glass Slipper and Star One Credit Union on El Camino Real. Two women live in the apartment, and one of them was studying in her bedroom when a man wearing gloves and holding a flashlight entered her room, police said. The man turned off the lights in the apartment and sat down next to her on the bed. One of the questions he asked was the woman’s age. The woman left the bedroom to find her female roommate. That’s when the man left. The woman described the intruder as an Hispanic male in his mid-30s, 5-feet-8, weighing 180 pounds. He wore a dark hooded sweatshirt and black pants. Anyone with information about this incident is asked to call police at (650) 329-2413. Anonymous tips can be e-mailed to paloalto@tipnow.org or sent via text message or voicemail to 650-383-8984. Did that burglar do a bit of weed before breaking in? Just asking the obvious question. If I were a burglar, I’d also be asking my victims their age. Makes sense to me. Why would anyone think that’s unusual? I kept thinking this guy looked familiar…then it came to me. A younger version of the actor Alfred Molina.